Does your puppy often look like Oscar from Sesame Street? Does his coat get messy, dirty, tangled, or all of the above, on a regular basis? If so, he's a pretty typical pup! Life is busy, and keeping Fido neat and tidy may not be at the top of your 'to-do' list, but a daily 'tidy up' session is a good idea for lots of reasons. Apart from being good for his self-esteem (!) it's a great way to get your puppy used to being handled and touched. Plus it gives you a chance to check him out all over and spot any early signs of trouble (such as parasites or injuries). Plus frequent brushing will reduce shedding (significantly!) and help to keep your home a fur-free zone, which is really important if you don't want to vacuum twice a day, or have family members with allergies etc. Keep each session short to begin with, gradually increasing them as Fido gets used to the whole thing. It's good to get into the habit of doing a quick physical check this way once a week or so. Run your hands over Fido's whole body and feel for lumps, bumps, scratches etc. Also look for fleas and ticks. Check each paw for cuts or thorns. They should be clean and odor free. If they look red, hot or inflamed or if there's discharge, they look dirty or gritty, or they smell bad you need to have your veterinarian take a look. They should be clear and bright with no discharge. A cloudy/white appearance can mean infection or injury. Tear staining can be treated with Angel Eyes and/or special cleaning products. Look for broken teeth or cut gums (sometimes a puppy can get a bit vigorous in his chewing and hurt his mouth). Regular chewing on his toys and other specialties such as 'Greenies' (specially designed, edible chew toys that help to keep his gums healthy), should keep his gums and teeth in good shape. But as Fido grows up it's still a good idea to check regularly for plaque build up on his teeth. Make a habit of doing this once a month or so because good dental care is very important, and get into the habit of brushing his teeth regularly. See Brushing Puppy Teeth or Dog Teeth Cleaning 101 to learn how to get this important task done right! Unless he's shedding very heavily, has a very long, thick coat or is a show dog, you'll find that brushing Fido once a day is enough. During the times when your dog is losing lots of his hair (shedding) is a problem, use a shedding comb or blade to make sure the job gets done properly. Check out this page for more info. on how to handle this... About Dog Shedding. If you have a full coated or long coated puppy, don't forget to brush the hair on his chest and tummy, it can get matted quite easily. The same for the hair on his back legs and under the tail. 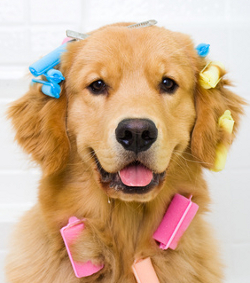 Click here to find out which dog grooming aids are best,and how to use them properly. You'll only need pretty basic tools to start with, as your little one grows you can add to your collection if you want to. For general, everyday use a wide-tooth metal comb does a great job on short to medium coated breeds, a bristle brush or one with rounded metal 'pins' can also work well. Wire toothed 'slicker' brushes and Grooming Rakes are good for removing dead hair, but they can be sharp. If his coat is smooth, thin or if he's a little on the slender side, be careful as these types of tools can hurt him by scratching his sensitive skin. 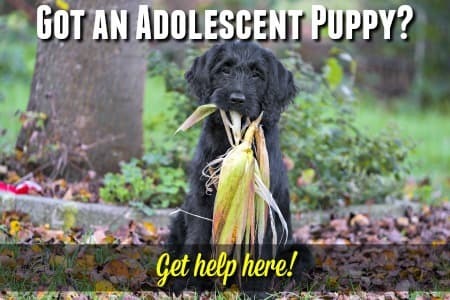 You want your puppy to like (although you may have to settle for tolerate) being groomed, so anything that causes him discomfort isn't a good idea. You don't want him to decide that the brush in your hand is Public Enemy #1! If your puppy is super-wriggly and just won't hold still, here's a handy little trick that just might slow him down! When you're working on a puppy and he's small enough to stand on a fairly small, low table (such as a coffee table), you can put a non-slip mat on the table and groom him while he's standing on it. He'll feel a little less secure up there and that translates into less squirming. To make the job even easier, put the table in front of a smooth, washable surface (such as the refrigerator or washing machine) and spread the surface with peanut butter. Your furbaby will be so busy licking off the peanut butter that he will forget all about wriggling! If your puppy is too large for a table, just stand him in front of the 'fridge - it works the same way. There will be times when your puppy needs more than just a brushing. These times call for a bath! How often you'll need to initiate tubby time depends on a lot of things, including whether Fido spends a lot of time outside; is long or short-haired; loves to swim in the lake; or insists on splashing through EVERY puddle on your daily walk. Bathtime may be necessary but it doesn't need to be a chore. 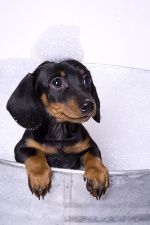 See my Bathing-A-Puppy page for a step by step guide that will have your puppy clean and sweet smelling in no time. it's important to keep Fido's nails short to prevent them splitting or breaking. Your puppy probably won't jump for joy when you try to cut his nails but it's a process he needs to get used to and accept as a regular part of his grooming routine. See our Cutting Puppy Nails page for lots of tips on how to make this important task easier for both you and your puppy. Hair Loss? Patchy Coat, or Irritated Skin? As I mentioned at the beginning of this page, when you're grooming your pup/dog it's the perfect time to check him for potential problems such as lumps, bumps, injuries, parasites and more. Patchy hair loss, bald spots, red irritated/inflamed skin or a rash can be signs of parasitic problems such as Mange or fungal infections such as Ringworm. 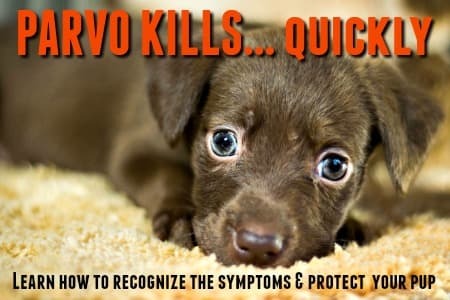 If you notice any of these, have your vet take a look at your pup so that if there is a problem you can get it diagnosed and treated quickly. This is always less expensive and less complicated than taking a 'wait-and-see' approach and then being forced to treat a condition that is already advanced!